A wideband UEGO sensor controller accurately monitors Air/Fuel ratios (AFR) during the tuning process to prevent a lean fuel mixture, which could lead to engine damage. AEM has combined its single-channel wideband UEGO controller and gauge display into one unit, uniting unsurpassed AFR accuracy and control with an easy-to-read interface. 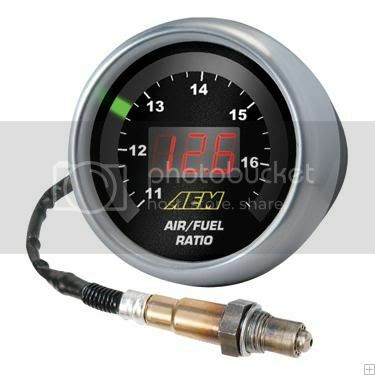 AEM�s Gauge-Type Wideband UEGO Controller features a digital LED display and sweeping LED �needle� that changes colors as AFR changes from rich to lean. The unit�s 52mm (2-1/16�) gauge housing fits in most gauge pods and can be remotely mounted virtually anywhere. We have a couple of these on blowout at the moment. Please PM me for pricing or any questions. 9.75% California tax applies if you are in California. Pm for price of wideband + sensor please! PM me a price shipped to 37745 please.